- the engine is not running. - there is a brake system malfunction. - there is a malfunction in the power supply or the vehicle's electrical system. The power assistance for the steering and the brake force booster do not work when the engine is not running. You will need more force to steer and brake, you may have to depress the brake pedal with maximum force. Before towing away, make sure that the steering can be moved and is not locked. You may only tow the vehicle a maximum distance of 30 miles (50 km). A towing speed of 30 mph (50 km/h) must not be exceeded. For towing distances over 30 miles (50 km), the vehicle must loaded onto a transporter. Do not use the towing eye for recovery, as this could damage the vehicle. If in doubt, recover the vehicle with a crane. Vehicles with differential locks: make sure that the differential locks are in automatic mode. When towing, the differential locks must not be switched on by hand. This could otherwise damage the transmission. Before the vehicle is towed, switch off the automatic locking feature. You could otherwise be locked out when pushing or towing the vehicle. Vehicles with a trailer tow hitch: if possible, secure the towing device on the trailer tow hitch. – Remove the towing eye required for frontal or rear coupling from the vehicle tool kit. 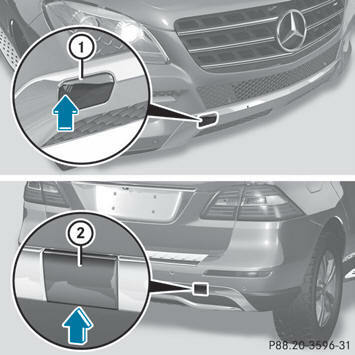 The mountings for the removable towing eyes are located in the bumpers. They are at the front and at the rear, under the covers. Observe the identification labels on the towing eyes and the information panels on using the towing eyes with the vehicle. The towing eyes must be installed in the correct positions. Install the longer towing eye at the front of the vehicle and the shorter towing eye at the back. – To open the cover at the front: press cover 1 inwards in the direction of the arrow at the marking. – To open the cover at the rear: insert a flat, blunt object into the cutout and lever off cover 2 from the bumper. – Take cover 1 or 2 off the opening. – Screw the towing eye in clockwise to the stop and tighten it. – Loosen the towing eye and unscrew it. – Attach cover 1 or 2 to the bumper and press until it engages. – Place the towing eye in the vehicle tool kit. When having your vehicle towed, observe the important safety notes. The power assistance for the steering and the brake force booster do not work when the engine is not running. You will then need much more effort to brake and steer the vehicle. Adapt your style of driving accordingly. The automatic transmission automatically shifts to position P when you open the driver's or front-passenger door or when you remove the SmartKey from the ignition lock. In order to ensure that the automatic transmission stays in position N when towing the vehicle, you must observe the following points: – Make sure that the vehicle is stationary and the SmartKey in the ignition lock is in position 0. – Turn the SmartKey to position 2 in the ignition lock. On vehicles with KEYLESS-GO, use the key instead of the Start/Stop button. – Depress and hold the brake pedal. – Shift the automatic transmission to position N.
– Release the brake pedal. – Release the electric parking brake. – Switch on the hazard warning lamps. – Leave the SmartKey in position 2 in the ignition lock. When towing with the hazard warning lamps switched on, use the combination switch as usual to signal a change of direction. In this case, only the turn signals for the desired direction flash. When the combination switch is reset, the hazard warning lamps start flashing again. – Prevent the vehicle from rolling away by applying the electric parking brake. – Shift the automatic transmission to position P.
– Turn the SmartKey to position 0 in the ignition lock and remove the SmartKey from the ignition lock. Vehicles with 4MATIC must not be towed with either the front or the rear axle raised, as doing so will damage the transmission. If the vehicle has transmission damage or damage to the front or rear axle, have it transported on a transporter or trailer. If the battery is defective, the automatic transmission will be locked in position P. To shift the automatic transmission to position N, you must provide power to the vehicle's electrical system in the same way as when jump-starting. Have the vehicle transported on a transporter or trailer. If the drive wheels have become stuck in loose or muddy ground, pull the vehicle out with extreme caution, particularly if it is laden. Never attempt to recover a stuck vehicle with a trailer attached. Pull out the vehicle backwards, if possible using the tracks it made when it became stuck. Vehicles with automatic transmission must not be started by tow-starting. This could otherwise damage the transmission.